The 2006 Stampede Edition of the V6 Premium Coupe with the Pony Package (17-inch painted aluminum wheels, grille-mounted fog lamps, and spoiler), chrome exhaust tip, dual over the top silver racing stripes, Pony spinner wheel caps, a Stampede gas cap, and an engraved serial numbered plaque on the dash. They could be ordered with an automatic or manual transmission. You could choose between Redfire, Vista Blue, Black or Tungsten Gray. Only 500 units were built. This was a factory Ford regional special only for the dealerships in Oklahoma and Texas. 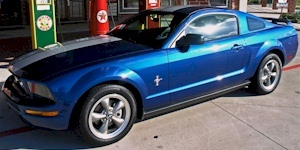 This is a Vista Blue 2006 Mustang Stampede Edition coupe. It's owned by Jason Stedry from Allen, Texas. This is a factory Ford regional special only for the dealerships in Oklahoma and Texas. Only 500 were produced. The Stampede Edition consists of the V6 coupe with the Pony Package (17-inch painted aluminum wheels, grille-mounted fog lamps, and spoiler), chrome exhaust tip, dual over the top silver racing stripes, spinner wheels, a Stampede gas cap, and an engraved serial numbered plaque on the dash. This is the first regional special Mustang created by Ford since 1968. Jason's was not ordered by the dealer with the spinner wheels. Jason Stedry sends us this hero card showing a Redfire 2006 Mustang Stampede Edition coupe. This is the front of the card. It explains the Stampede Edition standard items on the V6 coupe; 9-inch racing stripes, exclusive badging, 17-inch painted aluminum wheels with spinners, pony grille with fog lights, chrome exhaust tip, and a spoiler. Only 500 units were produced by Ford. They were only available for sale from dealerships located in Texas and Oklahoma.